Reader Kent (sorry about the headline, mate) writes in from New Zealand to comment on a quite controversial traffic rule, which seems as if it may be on the outs. As the image above shows, at uncontrolled intersections the car making a left turn (remember, they drive on the other side of the road, folks) must yield to an oncoming vehicle waiting to make a right turn across the intersection. Judging by articles like this one, which clocked hundreds of violations at a single crossing, this is a law that is in serious conflict with the social norms. He said an initial analysis of a rule-change proposal in 2004 estimated it would mean at least eight to 24 fewer intersection casualty crashes a year. Another ministry official confirmed later that the figure could be as high as 56 fewer injury crashes, yielding annual social cost savings of $12.8 million a year, if intersection safety improved as much as it did in Victoria after that Australian state reversed a similar rule in 1993. Kent thought this practice might be called the “shortest radius” rule, and he speculates it had something to do with farm implements. He’s not sure where and when (and why) the practice began — any NZ engineers out there who can enlighten us? Left-turning drivers appeared to rely more on the whites of the eyes of those lining up in the opposing direction, rather than checking rear mirrors to see whether there were straight-heading vehicles behind to lend them cover. Institution of Professional Engineers transport group chairman Bruce Conaghan believes it too risky to rely on left-turning traffic to predict the intentions of vehicles behind them, and says right-turning drivers have a far safer vantage point from which to judge when it is safe to go. Maybe it’s late in the day here, and my head’s all turned round with this “wrong” side of the road stuff, but does this mean drivers can turn left on a multi-lane street from the lane not closest to the corner — i.e., so they’d be making a left turn across a stream of “inside lane” traffic that might be continuing straight from behind? That’s what I’m discerning from the quote above, but I may have it all wrong. Comments Off on Kiwi Kommuters in Krossing Kerfuffle, Khronikles Kent. Click here to leave a comment. 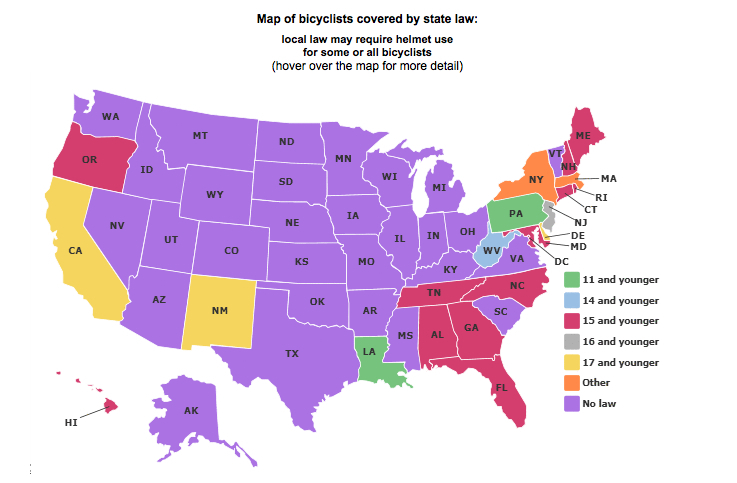 In the first of a series, the Insurers Institute for Highway Safety maps the dizzying patchwork of traffic laws across the country, starting with motorcycle/bicycle helmets (visit the actual site to activate the map). I did not know there was a law on the NYC book that a passenger younger than one year old was not allowed (though I can’t say I’ve ever seen that law violated). Comments Off on Mapping Traffic Laws. Click here to leave a comment. The Boston Globe reports on a Cambridge mechanic who has installed his car’s steering wheel in the exact center of its dashboard. When he went to purchase car insurance he was told the premium would be $3,000 because the vehicle was so “unusual.” That was too steep for him, so he decided to keep the car strictly as a piece of spiritual artwork alongside dozens of other sculptures adorning his auto repair shop, Aladdin Auto Service. How was this $3000 sum dreamed up? Are there actuarial tables for “unusual vehicles” — has someone calculated the average risk entailed by driving, say, a car that converts into a boat? Or is there a standard “nutty artist rate,” like for those goth hearses you sometimes see, or that “pedal car” that was in the news a while back? Come to think of it, I wonder what the insurance premium is for driving a right-side-drive car in the U.S.? Are those less safe because of the awkward fit with our roads, or does the driver increase his vigilance? Comments Off on Centrist. Click here to leave a comment. …Speck showed the downtown street configurations to traffic engineers outside the state and their first response was to guess the street grid was set up for a downtown density and traffic volume comparable to Chicago or Manhattan. I don’t know much about Oklahoma City (I’ve never been), but what’s with the highway-grade, six-laned streets? Is this is a relic of some oil boom? Was the city trying, through sheer boosterism and asphalt, to imagine itself as some Chicago of the plains? Evidently, it once had angled parking downtown; that, like two-way streets, were done away with by overzealous traffic engineers. It begs the question of when and how cities should downsize — or perhaps “rightsize,” to use that corporate euphemism of the 1980s. Comments Off on Where The Streets Have Too Many Lanes. Click here to leave a comment. After recently chatting with a journalist from the Australian Broadcasting Corporation, I’ve got the country on my mind. 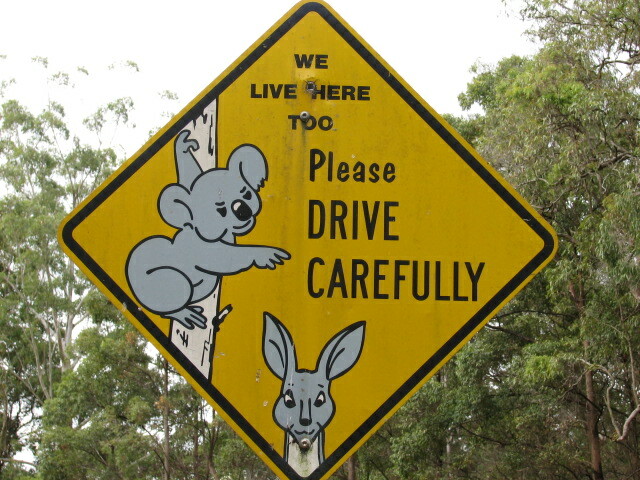 I was interested to note that over the period from 1995 to 2004, total road deaths in Australia dropped 21%. In the U.S. over that same period, the number actually increased, by 2%. Given that Australia and the U.S. have certain similar characteristics in roads and vehicles, the country is considered a particularly fruitful benchmark against the U.S. There are no doubt issues in terms of U.S. drivers having higher exposure, but measured in various ways (per person, per registered vehicle), the Australians logged much better performance over the same period. * Introduced a considerable number of traffic safety legislative and regulatory amendments to increase police powers, sharpen laws, and increase penalties. For example, a zero blood alcohol requirement was introduced for drivers in the first 3 years after licensing, the probationary license period was increased from 2 to 3 years, compulsory helmet wearing by bicyclists was introduced, the demerit points scheme was revised, and immediate license loss for all second and subsequent drunk-driver offenses was established. * Introduced speed cameras as a method of speed limit enforcement. * Increased random breath testing for the detection of alcohol-impaired drivers by a factor of at least five, to a point where (statistically) one in three Victorian drivers could be expected to be tested in any given year. * Began a long-term program of public education to support specific safety initiatives and keep traffic safety in the public arena. Comments Off on The View from Down Under. Click here to leave a comment.